This is short and sweet! 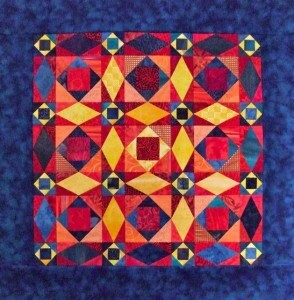 I just uploaded the fabric requirements for the BRANDY NEW 2012 BOM MYSTERY to the Carol Doak Quilting Group. This one is geared for beginners so if you want to play and learn at the same time, hop on over to the group and join in the fun. Posted in Uncategorized | Comments Off on Let the Fun Begin!!! 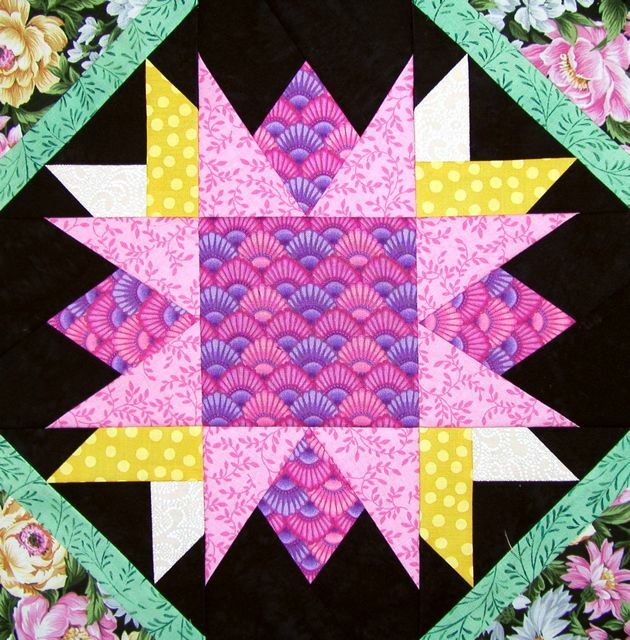 New Mystery Block of the Month Starting Soon!!!! Looking for a fun new project that is FREE? Have thought about joining the nearly 8,000 members of the Carol Doak Quilting Grroup? Like making things a little at a time? 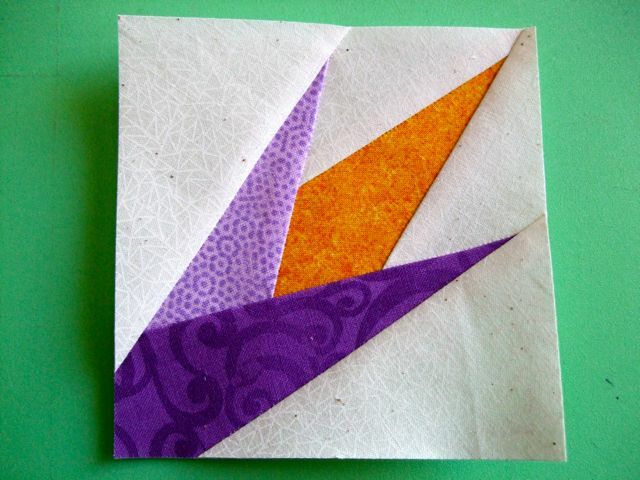 Want to learn to paper piece a variety of blocks? Like Block of the Months? 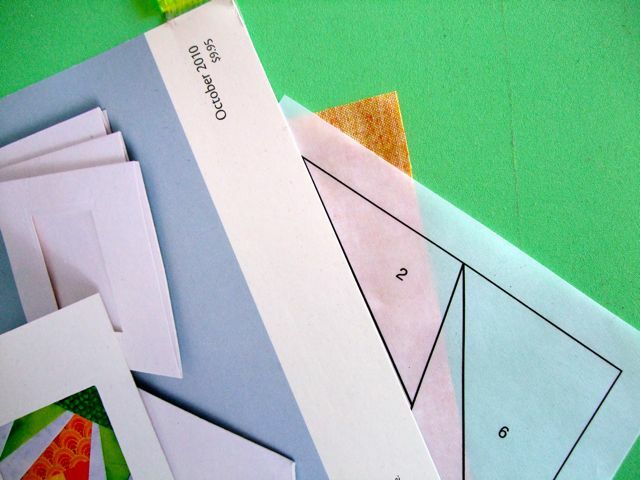 I am often asked the what would be a good book to purchase in order to learn the beginning steps for paper foundation piecing. 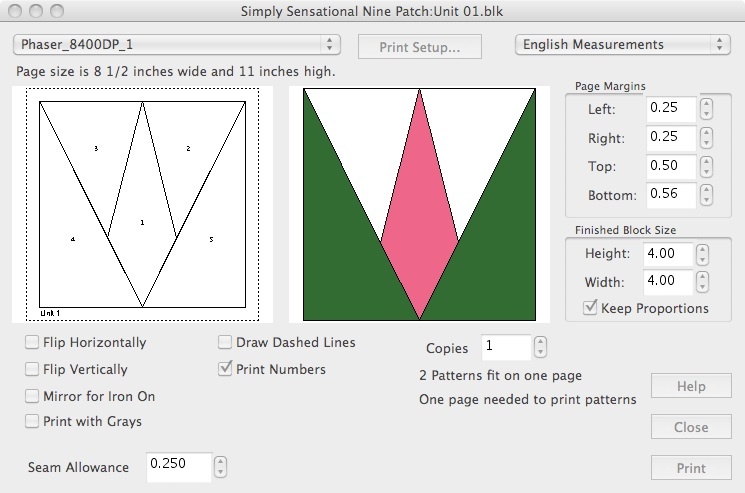 Although all of my books contain instructions on how to paper piece, Simply Sensational 9-Patch Stars is a super place to start. I have even put together a Starter Kit in my web store that includes this book, a package of foundation paper and the Add-A-Quarter ruler. With these three items, a new paper piecer is on their way. 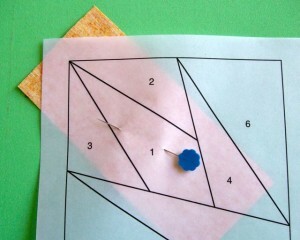 The blocks in the book are comprised of point units, center units and corner units. 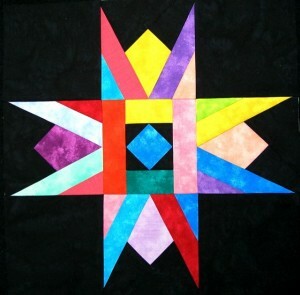 Mix and matching these units make up the 9-Patch Stars and more. The book comes with the Foundation Factory program, so it is just a matter of selecting the unit you would like to print, the size of the unit and how many and hitting “print” to create your foundations. The units themselves are very simple with few pieces so they are quick and easy to create. Even though they are quick and easy to create, the star blocks they create are striking. 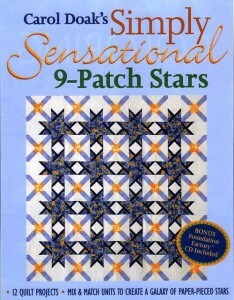 Above are three of the Simply Sensational 9-Patch Stars representing Alaska, Georgia and Kentucky. There are actually 50 of these blocks, each representing one of the US States. There are 9 quilts in the book, each made up from the units in the book. 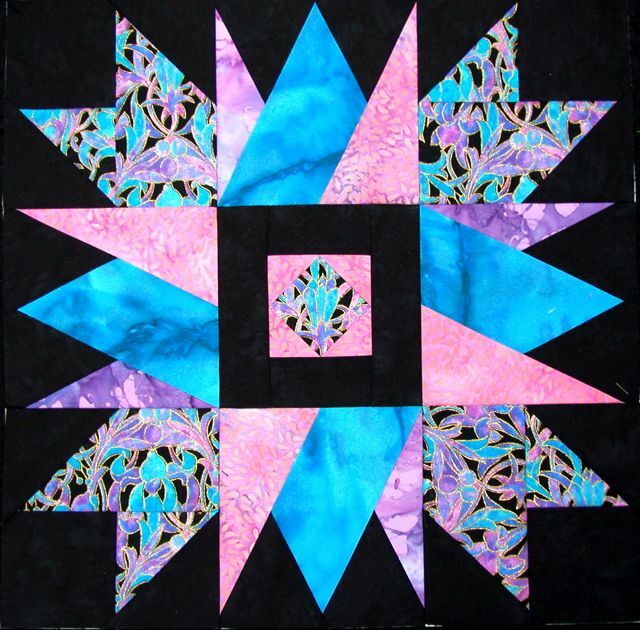 The quilt above is called Star Crossed and is made up using just two different foundations–a point unit and a corner unit. The corner units create a wonderful lattice connecting the star blocks. Ok, so just in case you think the possibility of 2500 star combinations and endless quilt options is too confining, consider this. You can take those units and enlarge them, reduce them and distort them offering even more options. The Storm at Sea pattern above was made using two simple center units. A book that teaches you to paper piece, keeps you in blocks, and offers amazing creative options is a super way to start to paper piece and continue to paper piece for years to come. It must be the weather and the explosion of spring colors beginning to show themselves, that has caused me to get into the swing of Spring. 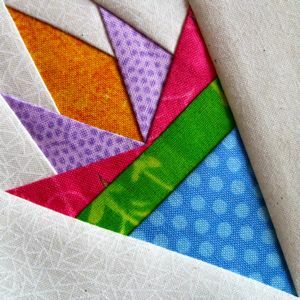 So, this morning I designed this darling 3″ nosegay block offering the opportunity to feature lots of Spring colors. 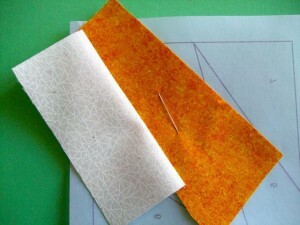 I uploaded the “Spring Fling” foundations and cutting directions in the Free Patterns Section of my web page. 2. Upload a picture on my Facebook page http://www.facebook.com/CarolDoakQuilts by April 18. 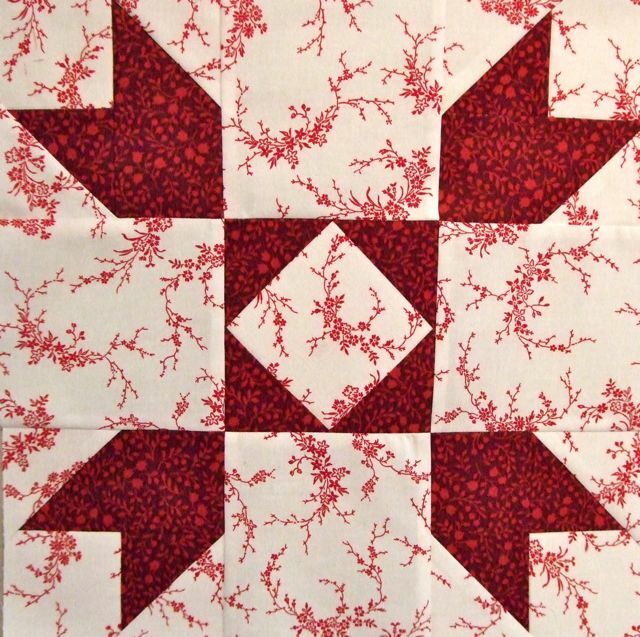 That gives you a week to make a block that should take you about 15 minutes. 3. The prize….From all those that upload their picture by April 18, on April 19th I will draw a random winner. 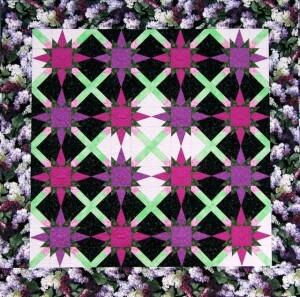 And the winner will win 4 yards of spring colored fabrics from my out-of-print fabric collections. You are welcome to share the fun with your friends…the more the merrier! 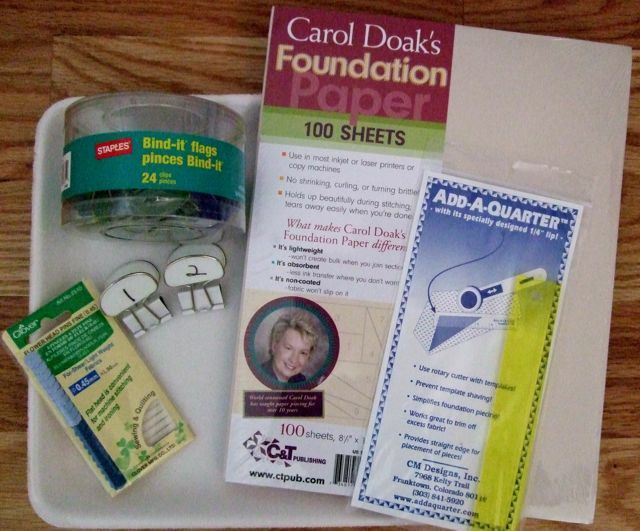 Carol Doak Foundation Paper-Perfect for paper piecing because it is easy to use, will not loosen the stitches when removed, eases when joining blocks and easy to remove. 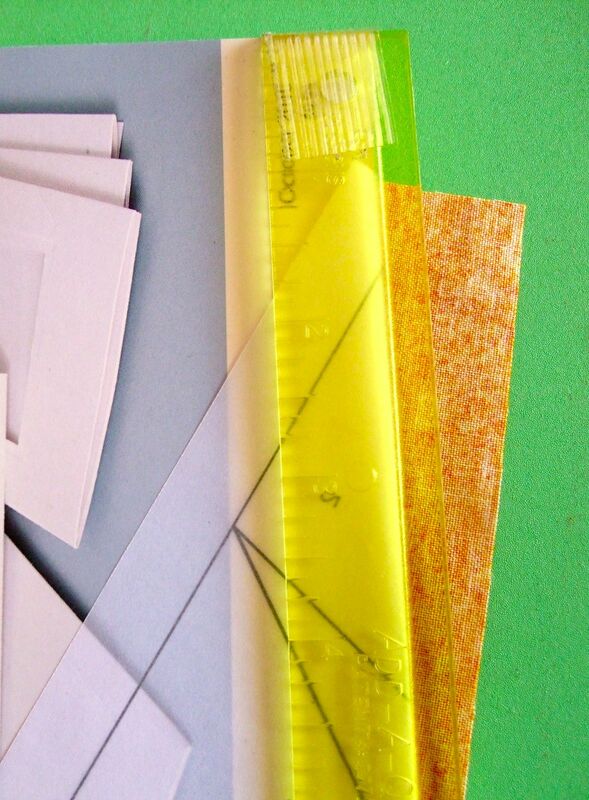 Add-A-Quarter Ruler attached to a postcard with the 1/4″ edge over the edge of the postcard. 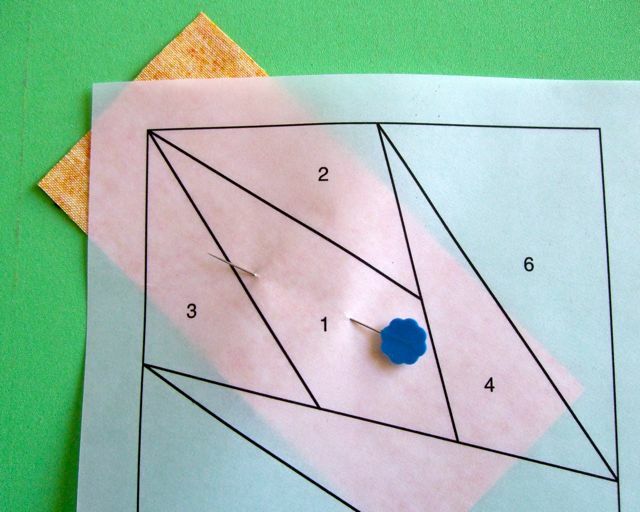 Place the ruler on the right side for right-handed cutting and left side for left-handed cutting. Iron set on cotton setting, no steam. 1. 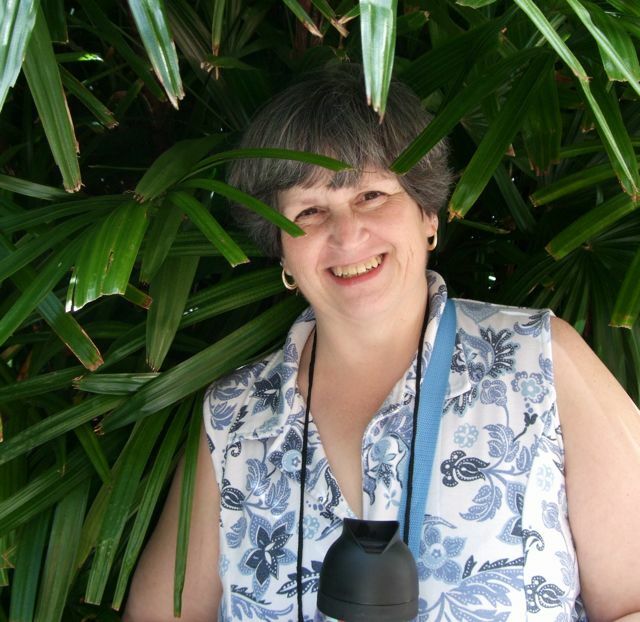 Select your foundation and print on Carol Doak Foundation Paper. I am going to use “Introduction to Paper Piecing” offered in the Free Patterns section of my web page. Please note that for the purpose of showing how this is done, I will use vellum in the photos below so you can see through the foundation. 2. 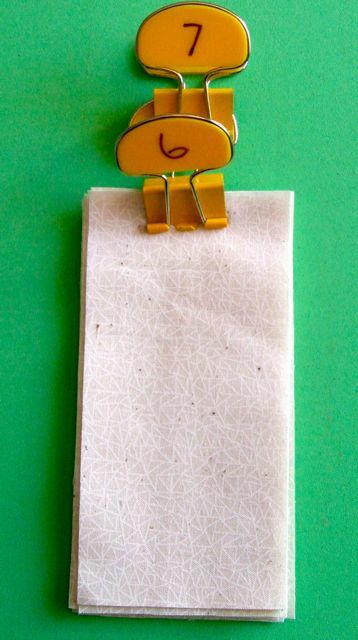 Print one of page 1 for your cutting list on copy paper. 3. 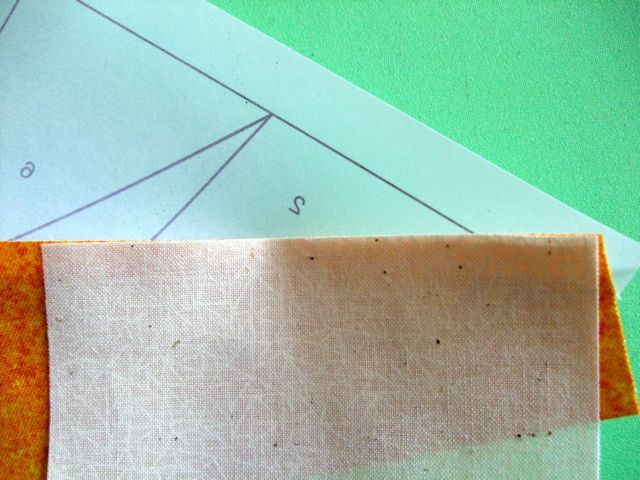 Print two of page 2 on Carol Doak Foundation paper to make four foundations. 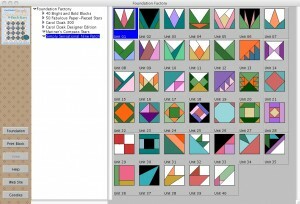 I will demonstrate making one block. 4. Using your rotary cutter and ruler, trim the foundations 1/2″ from the outside solid line. 1. Using the cutting list provided on page 1, cut and label your fabric pieces. 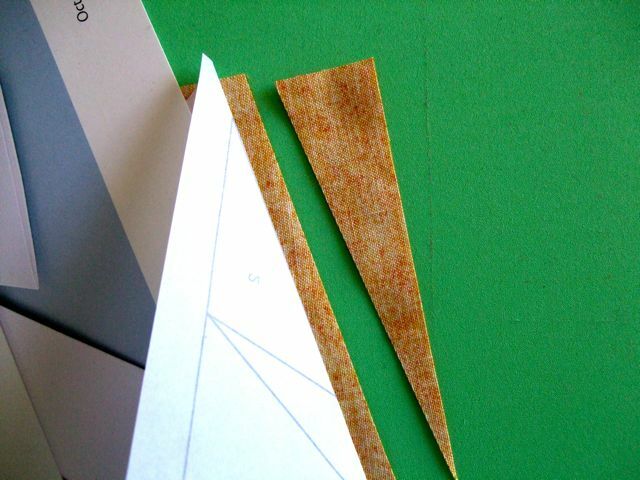 It is easiest to cut a strip the smaller measurement and then cut the lengths. 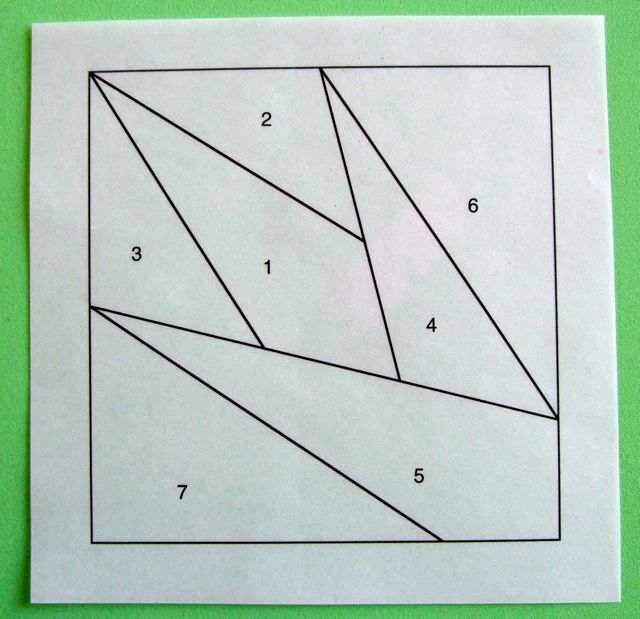 For instance, the first item on the list is 8 pieces, each 2 1/2″ x 5″ and they are used for location number 6 and 7. Cut a strip 2 1/2″ wide and then cut the 8 pieces each 5″ long from the strip. 2. 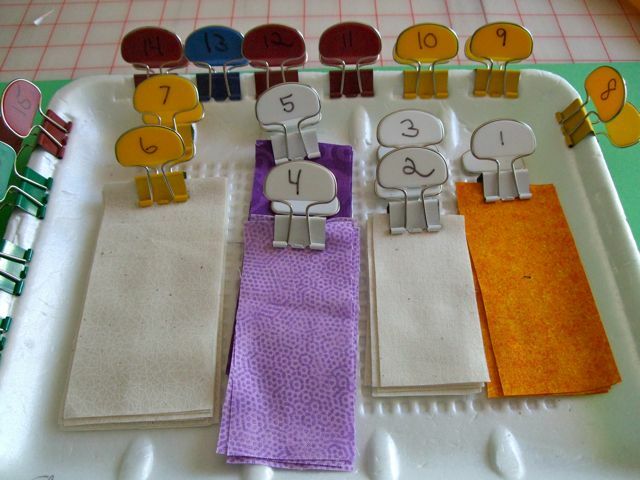 Clip your #6 and #7 Binder Flag to this group of fabric. 3. Cut the remaining pieces in the list in the same way and place them on a Styrofoam meat/fruit tray. 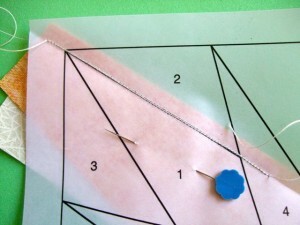 Set up your sewing machine with a neutral color thread, a 90/14 needle and 18 to 20 stitches to the inch. That is about a 1.5 on a sewing machine that has a range of 0-5. 1. 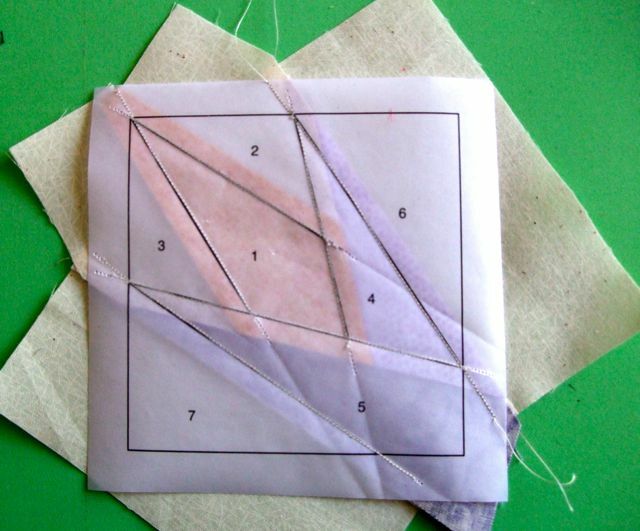 Select the #1 fabric piece and position it RIGHT SIDE UP on the BLANK side of the paper over the #1 area. Be sure that it covers the area completely with at least 1/4″ all around the #1 area. 2. Place the postcard on the line between #1 and #2. 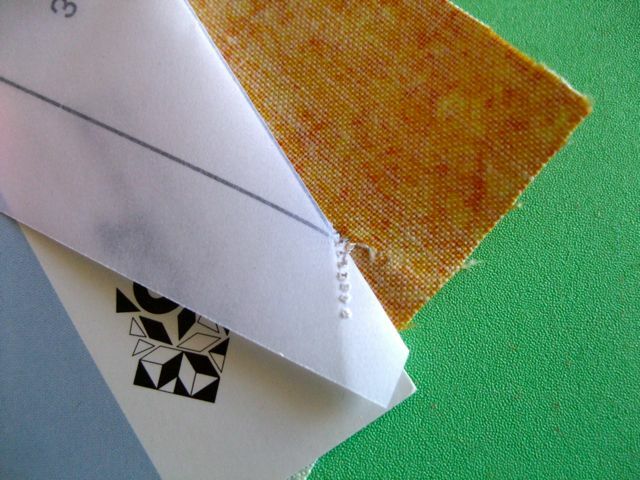 Fold the paper over the edge of the postcard exposing the excess fabric beyond the #1 seam line. 3. Place the Add-A-Quarter ruler along the edge of the fold and trim away the excess fabric. 4. Place the #2 fabric right side up over the area it needs to fill to ball park placement, then right side together with the previous piece along the just trimmed line. 5. 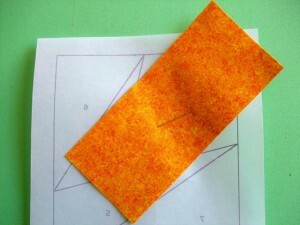 Confirm that the ends of the #2 piece will cover the #2 area. 7. 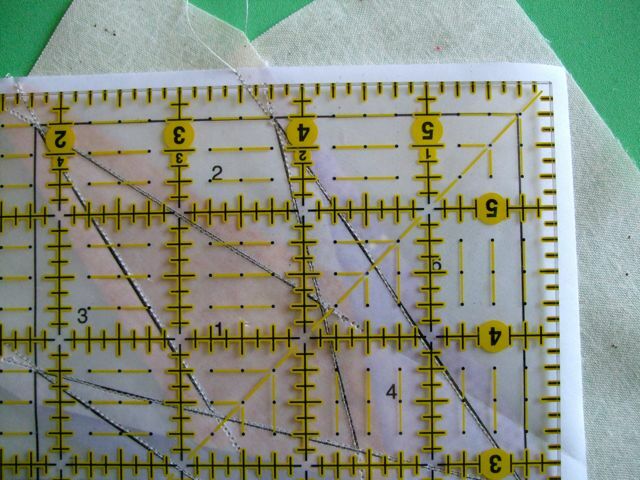 Place with the lined side up under the presser foot and sew on the line, extending the stitches 1/2″ on each end. Remove and press the #2 piece open. 8. Now, using the #3 line, follow the same sequence of trimming, sewing and pressing as described in steps 2 through 7. Remember when you extended the stitching on each end of the line? 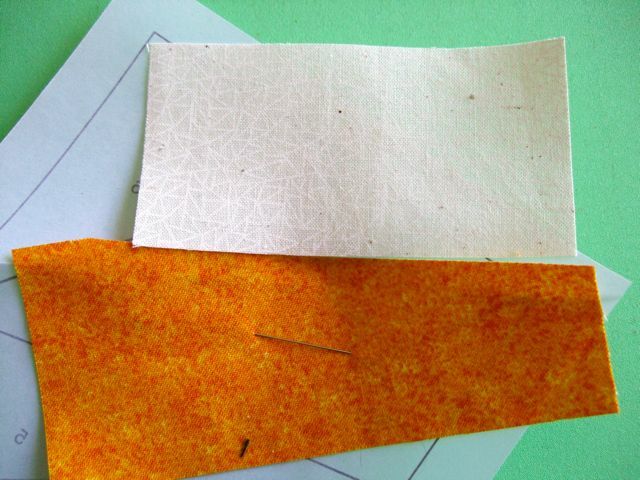 Well, when you place the postcard along the #3 line, you will need to pull away the stitching from the paper at the pointed end to fold over the card. That is fine. However, the fabric pieces will still be stitched in the seam allowance area and that cuts down on bulk in these areas. 9. 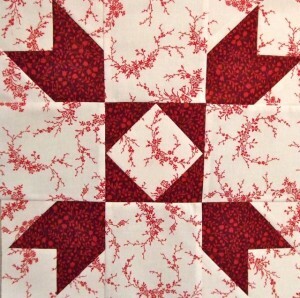 Once the #7 piece has been sewn the block is trimmed 1/4″ from the outside sewing line. 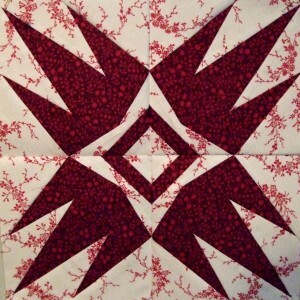 And here is your awesome block all finished with those perfect points. 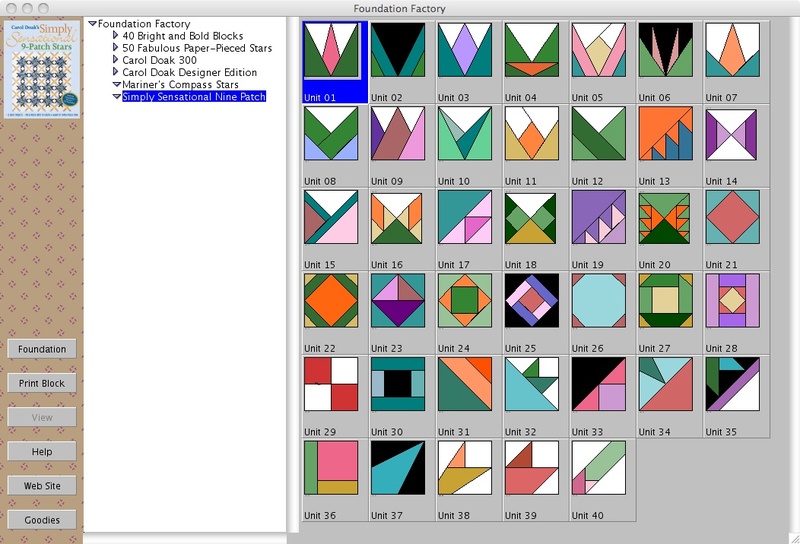 To make the 8″ block featuring a 4-block rotation, simply make three more blocks assembly-line fashion and join them. For lots of tips and tricks about paper foundation piecing (measuring your fabric pieces, joining blocks, speed methods etc. 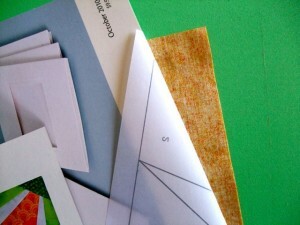 ), I would suggest any of my paper piecing books and/or DVD, Carol Doak Teaches You to Paper Piece. 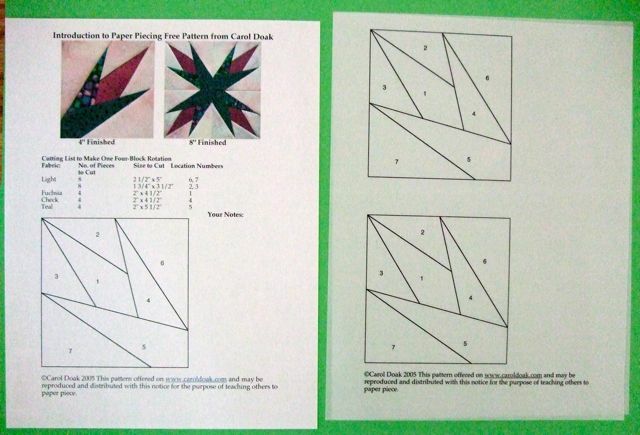 I hope these instructions will encourage you to give paper piecing a go and if you are already paper piecing, I hope they add to your enjoyment of this fun method. 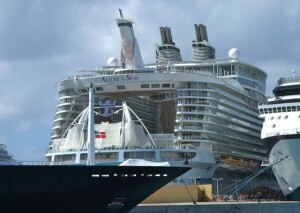 I have just returned from an absolutely fabulous cruise aboard the amazing Royal Caribbean Alure Ship. There I was, with lots of old quilting friends and new quilting friends for a fabulous 7 days aboard the largest ship in the world. Here Debby Luttrell and I are having just met up in the Promenade getting ready to go ashore in Nassau. 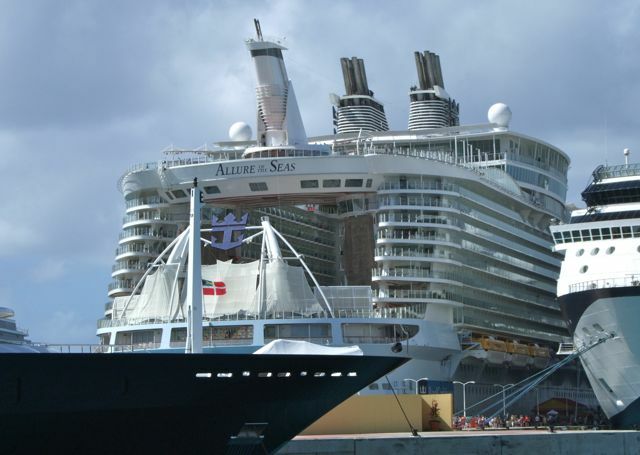 There are 5,000 passengers on this ship. Where are they? It was a beautiful day in port. The sun was shinning and the little shops were open and ready for business. My friend Rhonda found the perfect colorful little frock. Doesn’t she look happy! You really don’t appreciate just how big this ship is until you get off in port. Man, you could put one of the other ships inside this ship. Everyone walking back to the ship after a beautiful day. Back aboard ship we all went about the task of making new friends. Once the ship sailed out of port, the fun continued in the Casino….doesn’t everyone look happy? Now it was time to head off to our private dining room with the rest of the group to have diner. 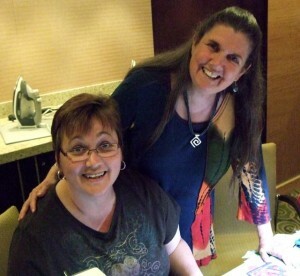 Something new on this trip was the option to table hop each night so we could have dinner with different quilters. After dinner, time to play with friends…so many options and so little time…shows, plays, music and the list went on and on. Here a group of us met up on the Boardwalk. Over 5,000 passengers and we kept running into our friends. Oooooh, I am not done….move on to read Part 2! After the ship left Nassau, it was time to start our first day of three classes. Here a happy student is showing off her first fish from the row I designed for the cruise. It was fun having students from the Carol Doak Yahoo Group aboard. Here is Cathy hiding in the bushes in Central Park. 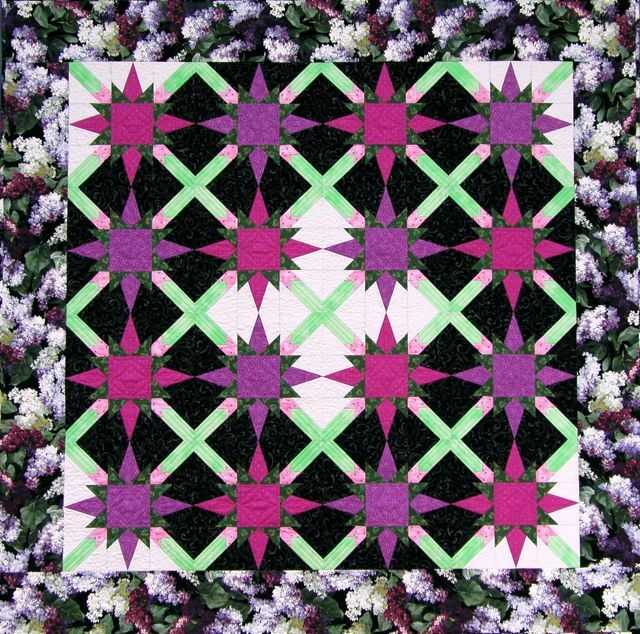 Gail Garber taught the top row of the quilt and Eileen Sullivan taught the bottom row of the quilt. This is a picture of the project for the cruise. 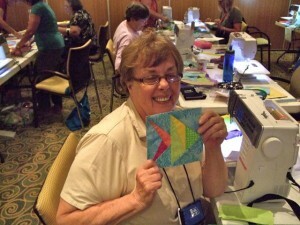 Debby made it really easy by kitting the project and supplying Bernina Sewing Machines. 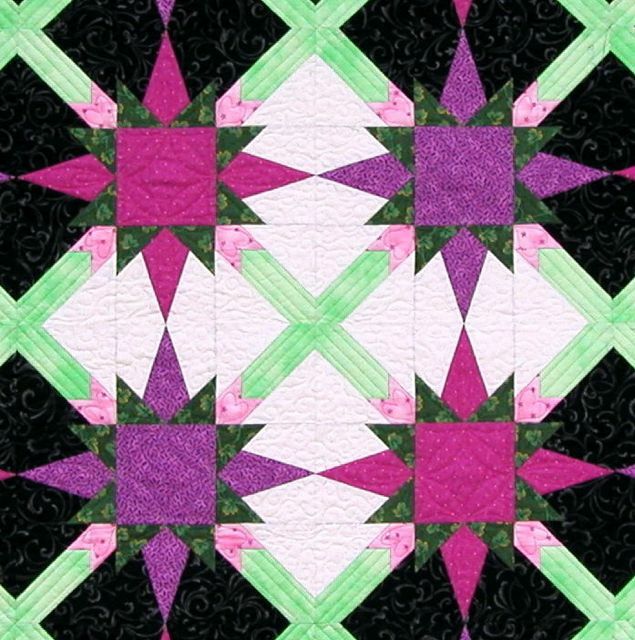 Two cruisers actually won this quilt and the one Debby had made. 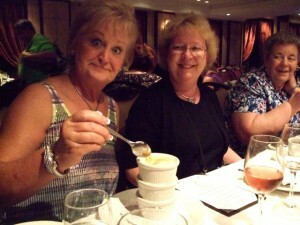 Time for dinner again and the special dessert that Debby really likes ….umm…is she really eating three of them?? Don’t they say “diamonds are a girl’s best friend”? 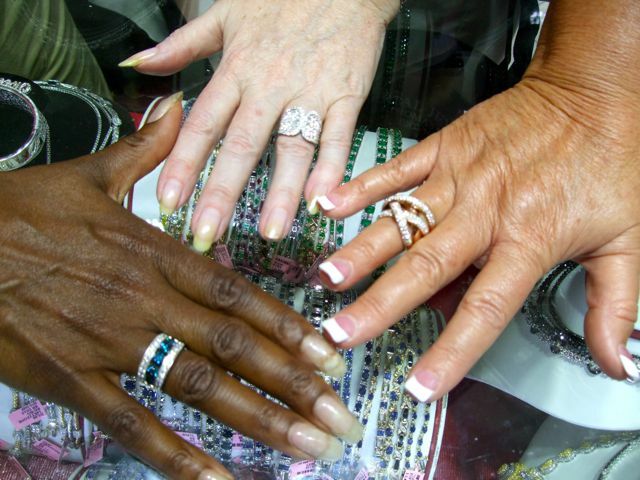 Well, I introduced Debby and Rhonda to my favorite jewelry store in St Thomas, Imperial Jewelers and we got into just a bit of trouble….. 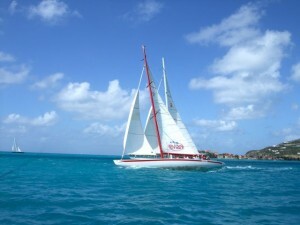 Speaking of trouble, next port is St Maarten. 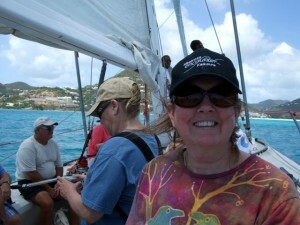 Gail, Rhonda and I signed up for the America’s Cup races. it was a beautiful day and we learned to sail. 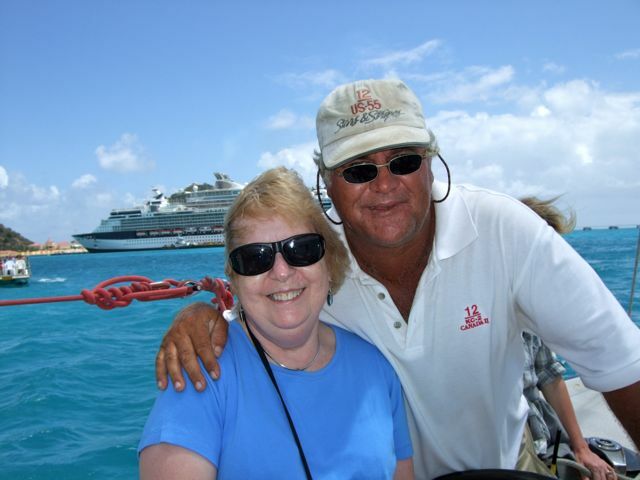 The captain said he could not have won the first leg of the race without the help he got from Gail, Rhonda and I.
Gail is smiling because we haven’t fallen overboard yet. It was time to head back to the ship and play with our friends in our group. 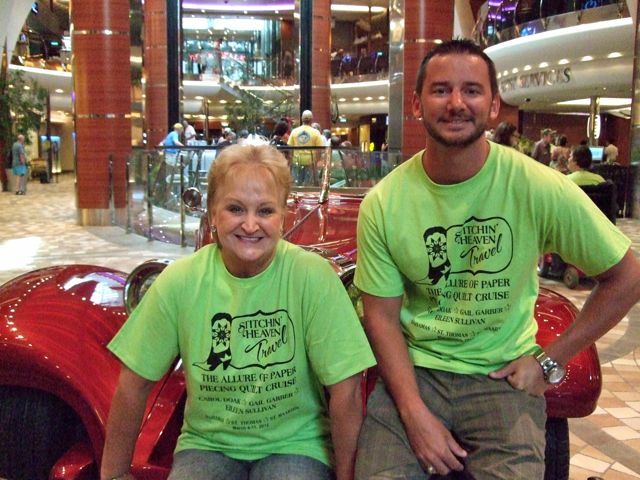 We could always find them when they wore our special Stitchin Heaven Travel T-Shirt. Here Debby and Clay (her son in charge of travel) are hanging out on a gorgeous car in the Promenade. Two more days of fun classes. The students stayed in each of three rooms and the teachers moved to the next room each day. I see fish swimming there. Besides all the amazing shows going on each evening, there are also special events that occur. This was 70’s night on the Promenade and the “Village People” showed up to sing YMCA!…Heh, I know that song. Cruise Hawaii in September 2013 is my next cruise. If you want to read all about it, click here. 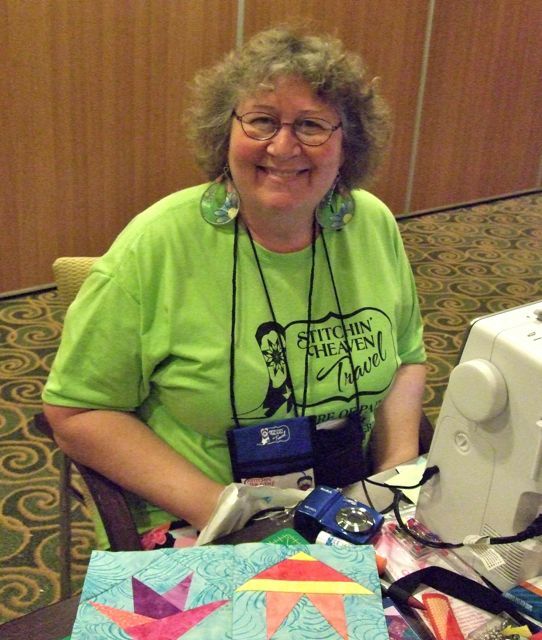 This cruise is limited to 40 quilters and you can sign on and pay a bit at a time. If you have any specific questions about it, just ask Debby or Clay. 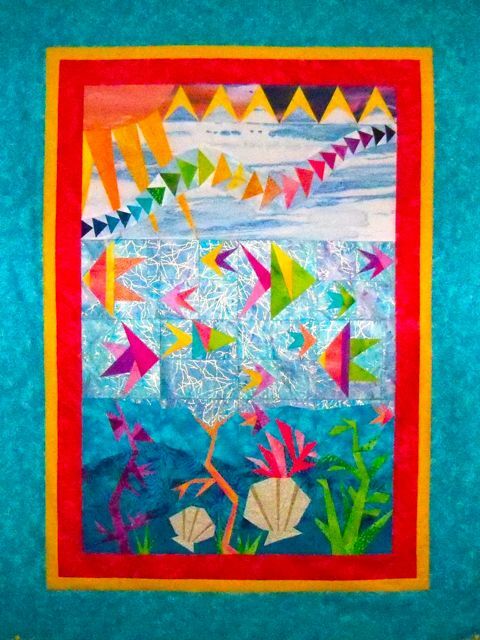 Amazing Dubai and the International Quilt Show of Dubai- Part Two. Maureen and Mary are two quilters from the local Dubai Quilters Guild. They took me off to visit the Ibn Battuto Mall after class. This mall is amazing. It is named after a 14th century explorer and each section of the mall is done in the style of the countries he explored.